Amidst the meeting of nations for the Olympics this summer are many opportunities for visitors to see specially created art and art exhibits in London and other parts of Great Britain. One work that is currently showcased for a wide public audience in London is Rocking Horse Boy, Powerless Structures, Fig. 101 by Michael Elmgreen (1961) and Ingar Dragset (1969), respectively a Dane and Norwegian, who have worked together for more than a decade. Their work is being featured this year in Trafalgar Square on its famous ‘fourth plinth’.Although not commissioned specifically for the Olympics, Powerless Structures, Fig. 101 resonates well with its setting as its ‘horse and rider’ theme not only speaks to the George IV equestrian statue on the first plinth in the square, but also to the skills of horseback riding featured in contemporary Olympic equestrian events. The design for the four plinths in Trafalgar Square dates back to the early 19th century when George IV asked John Nash,designer of All Souls Church in London, to develop a plan for the square. Eventually Charles Barry completed the plan in 1845. A monumental column at the centre of the square celebrates the victories during the Napoleonic wars of the British army led by Admiral Nelson who died at Trafalgar in 1805. Only three plinths were completed: one with a mounted George IV and two other statues of military figures who fought in India. For 150 years the last plinth remained uncapped and a focus of debate over its use. However, since 1999 the fourth plinth has been the locus of what may be the most provocative contemporary art competition in Great Britain. Generally winning commissions are on view for a year. The first work featured was Mark Wallinger’s Ecce Homo (1999), a monumental figure of Christ wearing a loincloth and crowned with a halo-like circle of barbed wire. Another work was Marc Quinn’s controversial 13-ton sculpture of an artist born without arms and truncated legs called Alison Lapper Pregnant (2005). Yinka Shonibare, an Anglo-Nigerian artist, created a colossal work entitled Nelson's Ship in a Bottle (2010-2011). Until Rocking Horse Boy it was the only work made with particular reference to the square’s historical meaning. Elmgreen and Dragset’s huge (4,1 metre) golden bronze sculpture of a barefoot boy clad in suspendered shorts on a rocking horse (sometimes also called a ‘hobby horse’) is cunningly simple looking and easy on the eye, especially for those who find much of contemporary art daunting to look at or understand. Its initial impact is one of serene playfulness and youth, even a certain heroism of youth. But there is more than meets the eye. The bold eyed rocking horse with its perky ears and stylized mane and tail is tilted backwards in a raised position, giving a whimsical take on the serious rearing stance found frequently in the tradition of western equestrian sculpture to show a rider’s mastery of the horse, even in this precarious position. In most cases the rider is a king or general who holds the reins of control over his government or army represented by the horse. While referencing the equestrian statue of George IV on the first plinth, Powerless Structures, Fig. 101 confronts the kind of control the 19th-century bronze symbolizes. What could be more powerless than a kid on a rocking horse? Hence, one supposes, the Fig. 101 designation. Ironically it interrogates the power expressed in the older sculpture and by extension authoritarian power in general. Although the boy firmly grips the bar that leverages movement with his left hand, and the boy’s stylized hair, raised right arm and splayed legs are vaguely reminiscent of a mounted Roman emperor or general, it is still a boy on his hobby horse conjuring up something far less stable than suggested by traditional equestrian portraiture. Along this line of interacting with the art of the past, Rocking Horse Boy also seems to allude to the subversive spirit of Dadaism, an early 20th-century destabilizing art movement that took its name from ‘dada’, a word meaning ‘hobby horse’ said to have been randomly found in a French dictionary by Dada’s originators. The Scandinavians’ engaging work belies its scathing edge in re-examining the power driven equestrian tradition in art and implicitly directs reflection to the nature of political power in contemporary culture. Their work might suggest an idealistic future with youth heroically leading society beyond tyranny. It is more likely that it suggests our world is at a perilous tipping point, environmentally, economically, socially, politically and religiously, while most of us blithely rock on. Michael Elmgreen and Ingar Dragset: Rocking Horse Boy, Powerless Structures, Fig. 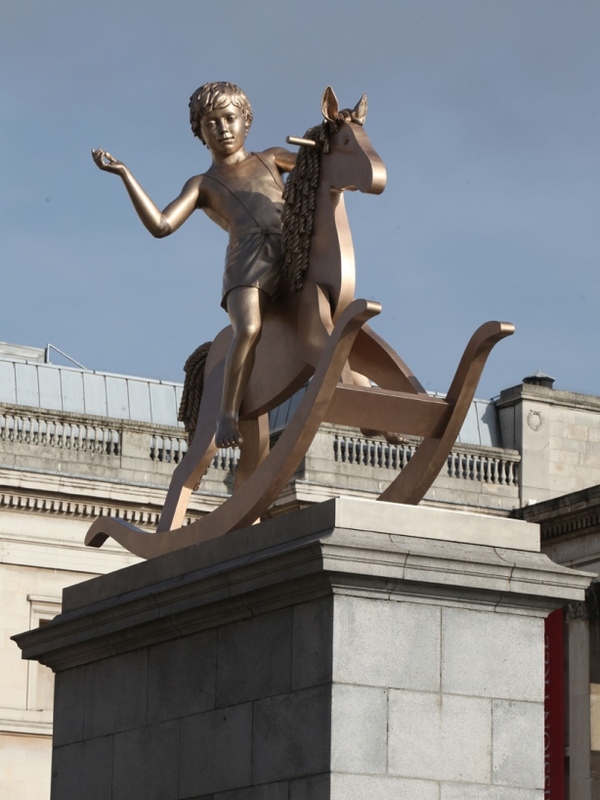 101, 2012, bronze, 4,1 m, currently located Trafalgar Square, London, England. Michael Elmgreen and Ingar Dragset live and work in Berlin, Germany. Since 1997 they have collaborated and created a large body of international work that wryly explores relationships between art, architecture, performance and contemporary culture. In Rotterdam (2011) their installation (The One & the Many) in connection with the Boijmans Van Beuningen Museum and daily performance (It's Never Too Late to Say Sorry) in front of the City Council building received wide attention. Their best-known artwork is Prada Marfa (2005), a replica of a Prada boutique permanently situated in the middle of a desert in Texas. The creation of ‘powerless structures’ has been a theme of their work since the beginning of their collaboration. Laurel Gasque is Associate Editor of ArtWay and the author of Art & the Christian Mind: The Life & Work of H.R. Rookmaaker.She teaches Art History at Trinity Western University (Langley, BC, Canada) and Christianity and the Visual Arts at Regent College (Vancouver, BC, Canada).